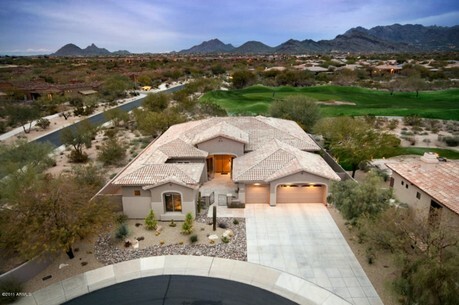 Grayhawk is a 1,600 acre master planned community located in North Scottsdale, Arizona. Grayhawk real estate was designed with unique architecture and distinctive design to compliment the beautiful natural desert surroundings. The Grayhawk community consists of more than 4,000 residential units with a broad mix of housing types ranging from traditional single-family homes to low-maintenance condominiums and townhomes, and even feature a fine selection of luxurious custom-built homes. Grayhawk works to build a sense of community with 30 miles of hiking, biking and jogging trails, barbecue pavilions, tennis courts and neighborhood swimming pools. Every Grayhawk resident has access to the Resident Program Director who maintains a yearly calendar of Grayhawk’s schedule of sporting events, social functions and cultural activities makes Grayhawk an outstanding, family-oriented, community. Grayhawk features two distinct, yet interconnected neighborhoods spanning 497 acres: The Park and The Retreat. The Retreat is different from The Park in that it divided into two communities; Talon and Raptor. The 539-acre, resort-style guard gated neighborhoods contain 15 subdivisions and offer variety of residential choices ranging from custom single-family homes to luxurious townhouses ranging from 1770 to 3744 square feet. At present, homes at The Retreat range from the low $600,000’s and exceed over $1 million with the highest prices going to those homes located on the golf course that offer the most attractive settings and views. The Retreat contains two, 18-hole golf courses; the Raptor and Talon courses. 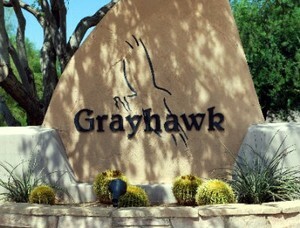 Grayhawk residents and guests alike can choose from either of the two daily fees. There is no requirement for membership; you only pay when you want to play. The Raptor is a 7,108 yard, par 72 course designed by award winning golf course architect, Tom Fazio. The 40,000 square foot Grayhawk Clubhouse includes the Quill Creek Café and Phil’s Grill, as well as a golf shop, locker rooms and conference rooms. You'll find the very latest homes for sale in Grayhawk featured below. This information is updated throughout the day so be sure to check back often! Search the complete inventory of Grayhawk homes for sale by price, community amenities, square footage and more using our detailed ADVANCED SEARCH option. See something that interests you? Want more information? Contact Us anytime to schedule a private showing for any property you find on this site or for more information on the community of Grayhawk and all Scottsdale area real estate.